What should one think about when saying the Shema? What is meant by Menuchas HaNefesh (a “Calm Mind”)? How could Elisha Ben Avuya have lost his Emunah? What is meant by pointing at Hashem? How does one acquire Emunah? What if one doesn’t have the ability to believe? If Emunah is instinctual why is it so hard to believe? A decent man without Torah? What practical things can a person do to work on Bitachon? Why was Yosef punished for a minor lack of Bitachon? How does someone deal with betrayal? Why were the younger ones the successful ones? Why does Hashem make things seem hopeless at times? Is it possible to forestall trouble? Why did David fight so many battles? Why not have Bitachon? Why does a person have to work? How should one deal with lack of success in Parnassa? How much effort should one put into finding a Shidduch? What does it mean “A person is led the way he wants to go”? Can people die before their time? 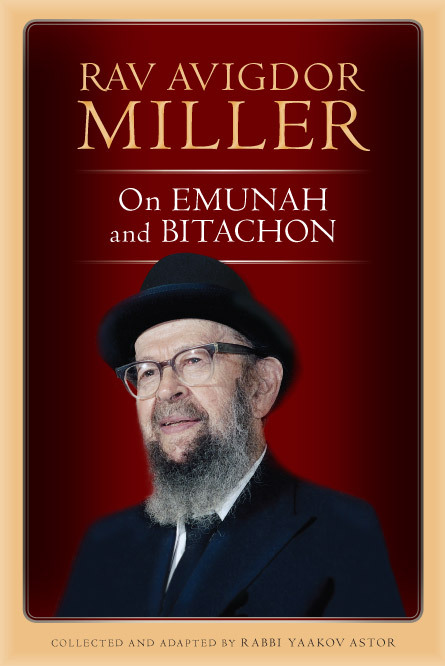 This entry was posted in Books by Yaakov Astor, Emunah/Faith, Rabbi Avigdor Miller, Rav Miller on Emunah & Bitachon and tagged Bitachon, Emunah, Rabbi Avigdor Miller, Rabbi Miller, Rav Avigdor Miller, Rav Miller, Table of contents. This book is intended for everyone from the most uninitiated to the most advanced student. Indeed, the general topic of emunah and bitachon, “faith and trust,” is for every human being: man and woman, adult and child, Jew and non-Jew. Like a gushing fountain, it’s a never-ending subject, completely replenishing itself with time. The youngest child can attain (and should be taught) some understanding of it while at the same time adults build on that understanding (hopefully) as time goes on. His same words that struck a chord with the uninitiated caused great excitement to the advanced student. This ability, combined with his vast erudition and depth of knowledge, makes a book by him on the subject of faith something the widest spectrum of people can understand — and not only understand, as Rabbi Miller would say, but to utilize to change and grow; to make oneself a better person. Although Rabbi Miller authored 12 books on his own, he left thousands of recorded lectures which include many ideas and/or many nuances of ideas that were either not necessarily mentioned in his books or explained in as much detail in those books. Our topic, emunah and bitachon, is implied in and indeed oozes from all his writings and recordings, but none of the books talk about it as explicitly or at least in once concentrated area as we have endeavored here. This book is based primarily on the following lectures recorded by Rabbi Miller. This entry was posted in Books by Yaakov Astor, Emunah/Faith, Jewish Thought, Rabbi Avigdor Miller, Rav Miller on Emunah & Bitachon and tagged Avigdor Miller, Bitachon, Emunah, Rabbi Avigdor Miller, Rabbi Miller, Yaakov Astor. Virtually every decision we make is affected by our grasp of the principles of emunah and bitachon (faith and trust in Hashem). But where do we turn to gain clarity about these issues, to find answers to our many questions? Rav Avigdor Miller, zt”l, answered that need for thousands of Jews, and more than a decade after his passing, he continues to do so. Rav Miller left behind a vast legacy of recorded shiurim and writings. Now, thanks to the efforts of Rabbi Yaakov Astor, an important part of that legacy has been transformed into this monumental book. The themes of emunah and bitachon permeated a great many of Rav Miller’s shiurim and seforim, but the material was scattered in many different places and was thus hard to access. Now, that eye-opening material has been collected, assembled and organized into a fascinating question-and-answer book, a book that will answer your questions and bring you clarity when you need it most. Rav Miller’s bold, straightforward approach sheds a brilliant light on the most troubling, thorny issues that confront us. His crystal clear Torah wisdom will profoundly impact your life. This entry was posted in Books by Yaakov Astor, Emunah/Faith, Jewish Thought, Rabbi Avigdor Miller, Rav Miller on Emunah & Bitachon and tagged Bitachon, davening, Emunah, Faith, faith in God, prayer, Rabbi Avigdor Miller, shaar habitachon, tefillah, trust, trust in God, Yaakov Astor.